The small sword (or court sword, l’épée courte) is a weapon that began to spread across Europe as early as the 1630s. This weapon, effective in both attack and defense and designed for the thrust reached the height of its popularity in the late 17th-early 18th century; particularly in England and France. Due to the small sword’s practicality, lithe & lethality, it became the weapon used to dissolve disputes*. Because the small sword required fencing kill to handle, and due to its piercing nature, the small sword duel was deemed “more civilized” than weapons concentrated on slashing and hacking. 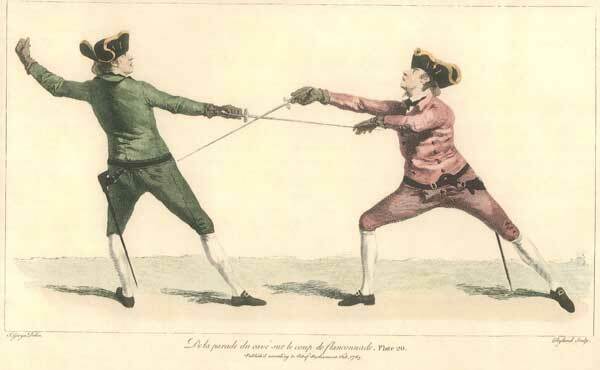 Almost essentially a thrusting weapon; although records exist of its occasionally being “sharpened as a razor” for dueling, the major French small sword instruction treatises focus solely on the thrust. The sword is easily recognized by its shorter blade (29-35in. ), Pas d’ane, quillon and knuckle bow. In 1653 a book by Charles Besnard of Rennes, a leading master showed conclusively that the French had finally improved on the Italians, whose masters had never allowed for purely defensive movements -every parry had also to be a thrust. Besnard (alleged to be the first to use the word “fleuret,” the French word for “foil) saw that always trying to do two things at once was a mistake and separated attack from defense… Besnard also introduced the formal salute, a symbol of courtesy and good form. Are all swords equal? No. Each of the various weapons of the past and present were/are constructed for specific purposes. What remains true (like all martial arts) is that skill (in this case, wielding the sword) is paramount. The evolution of weaponry has always been based on the necessities of battle (in other words, what tool is need to overcome a foe(s)), it’s intended use and trial and error. Fashion and practicality aside, the small sword was designed for the thrust – which as always been the most lethal of blows. It’s shorter length, gave the fighter more agility and control over the blade. Even though a dagger was often needed for close-quarters, the small sword carried on strong until the Napoleonic Age. 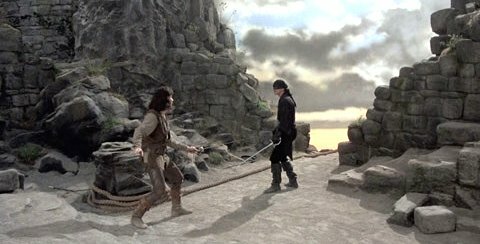 One of the most realistic scenes involving the small sword can be seen in the first fight in the movie, The Duellists. For small sword and bladed weapon enthusiasts everywhere, you’ll be happy to hear that the CombativeCorner will be conducting an interview with Jeannette Acosta-Martinez, possibly the foremost expert of the Small Sword and the French School of small sword combat living today. She is one of the main instructors at the Martinez Academy in New York. Read our interview with her husband and fencing maestro Ramon Martinez. 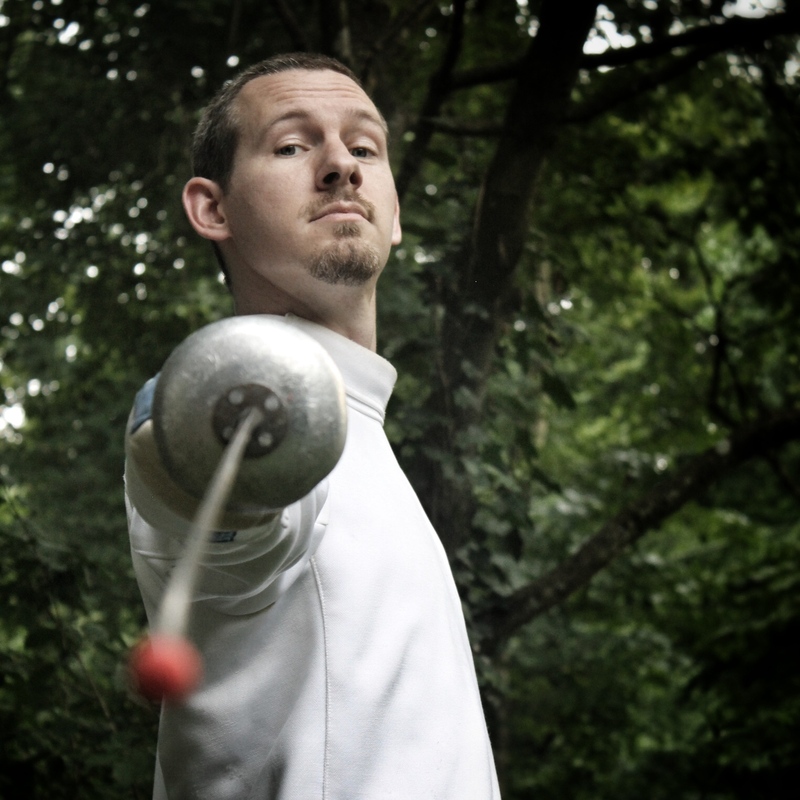 Coach Michael Joyce teaches classical foil fencing in Winston-Salem, North Carolina. Mr. Joyce got his training at both the St. Louis University (1998, 1999) and University of NC-Greensboro (1999-2002) Fencing Clubs. He has been teaching (fencing) professionally since 2005 and enjoys fencing with the French Smallsword, the Chinese Jian (straight sword) and Shaolin Rope Dart the most. Matt Easton is fencer, weapons historian and researcher and runs Schola Gladiatoria in Ealing, West London. We’ve been following his Youtube channel (which to this date has nearly 50K subscribers) for a few years now and we’ve always been impressed with Mr. Easton’s knowledge, enthusiasm and scientific approach. Now, for your reading pleasure you can hear the top 10 questions posed to Mr. Easton from you (the reader), us (the Combative Crew) and from myself (the fencer). Enjoy! How did you get into sword-play? As far as I can remember, I was born interested in swordplay; I can’t remember an age at which I was not obsessed with swords and everything to do with them. Like most kids I played with wooden swords, but in my teenage years I started modern sport fencing at school and also started trying to work out how real swords might have been used. I got a weekend job and saved up for my first real sword (a replica longsword), which I then used for lots of solo practice, just working out what could be done with it and how such a weapon should move. I also managed to find an instructional video by Mike Loades on renaissance swordsmanship for stage and screen and while I was at university I heard about Terry Brown’s English Martial Arts classes. I became a student of his for a couple of years and that was my proper initiation into historical fencing, from which I branched out to work on various other historical swordsmanship sources and eventually to become a teacher. How would you mark your evolution as a martial artist? I think that when I started studying various different martial arts, be it kung fu and kendo, or different Western historical swordsmanship treatises, I was first struck by all the similarities across different systems. Then as I started to focus more on specific systems and teach them I was struck by how some things are done so differently from one system to another. Some people talk about doing ‘German longsword’, or ‘Italian longsword’, for example, but actually there are a lot of significant differences between sources like Fiore dei Liberi, Filippo Vadi and Achille Marozzo – despite the fact that they all teach the longsword and are all Italian. Even more notable are the differences between a German source like Paulus Kal and an Italian source like Fiore dei Liberi – whilst there is a lot of common ground, the differences are really significant as well. There are some quite basic things that they did differently, despite both being in Europe in the same century and using the same weapon. Now I have been studying these systems for over 15 years I start to look beyond similarities and differences and I feel like I’m starting to understand the reasons for the differences more. Not the simple principles – anybody who has been fencing for a couple of years understands the basic universal principles of time, distance, line and so on. Rather I feel like I’m starting to see more complex patterns across various martial arts. So I would say that I mark my progress in martial arts through depth of understanding, but I’m sure that in ten or twenty years I’ll look back and realise I didn’t understand much at all. I think that the main purpose for depth of understanding is to enable more acute transfer of knowledge to students. Someone can become a competent fighter in quite a short period of time, but most competent fighters are not able to transfer their skills without a long period of teaching experience. As a collector of various weapons, what 3 are closest to your heart? That is a very difficult question for me, as I own a rather large number now, of which I have probably 15 swords which I am very attached to, for various reasons. I’ll give the first three that come to mind: A non-regulation infantry officer’s sword, by Wilkinson and dating to 1858, which has a special extra-long wedge-section blade and steel hilt covered in gilding to make it look like a brass regulation guard. This was owned by the adjutant of the 61st regiment of foot, who survived the siege and fall of Delhi during the Indian Mutiny – I also have his diaries. Secondly a non-regulation steel-hilted Royal Engineers officer’s sword, by Wilkinson and dating to the 1860s, which was owned by an officer who was a sort of Victorian James Bond. Officially an Army officer, he used to travel to areas which the British government had interests in and act as a spy, reporting back details of geography and defences, also trying to broker alliances. He was eventually killed in the Egyptian desert whilst trying to secure the alliance of the Bedouin prior to a British invasion. Lastly a current favourite of mine is a ‘Lead Cutter’ made by Robert Mole of Birmingham in around 1890. Lead cutters were over-sized, over-weight cutlasses, made specifically for sword feats, whereby various objects such as a lead bar or whole sheep carcass would be cut through with one blow. Sword feats were designed to improve cutting skill and also for fun and exercise. This example weighs 3.5lbs and is great for training with – it’s also in fantastic condition and still sharp. When did you start putting videos on YouTube and how has the process been? I started putting HEMA-related videos on YouTube several years ago to represent my club to a HEMA audience and potential new students, but around 2 years ago I decided that there was an un-filled niche for information videos about historical fencing, arms and armour. Most other people making HEMA videos were doing it for a HEMA audience, but I saw that there were a couple of popular multi-topic YouTube channels that had started to branch into HEMA. I saw them making some basic errors and realised that YouTube really needed a HEMA person to talk about HEMA – we shouldn’t be leaving it up to other people to represent us and nobody else in the HEMA scene was really doing it, at least not with regular videos. So I got a camcorder and started filming – I never had even the slightest sense that they would become anywhere near as popular as they are now. I genuinely wanted to do the videos to get the information out there and at first I wasn’t thinking about how to make them popular. Now I have nearly fifty thousand subscribers I’ve started thinking about it a bit more as a job and thinking about scaling it up – I’ve actually started editing my videos slightly now! The process has been very rewarding and I have been really amazed at how large the response has been, but also how positive it has been. We have had a really tiny number of negative responses and having run a discussion forum for many years I can say without doubt that there has been a lot more peaceful and civil discourse on the YouTube comments than there is on an average forum. As well as really positive input from the viewers I have also received a lot of positive feedback from other HEMA instructors and I know that many groups have now got more students thanks directly to my channel, which is hugely satisfying. YouTube really is an incredibly powerful medium for spreading information – more so than TV documentaries, publicity events, newspapers or any of the other mediums I have worked with over the years. And that is really what the channel is about – spreading the word of HEMA and getting more people into it. We know you as having a fondness for the saber/sabre. Why do you think you’ve developed such a fondness for this weapon above others? My love of the sabre comes essentially from three motivations; firstly that I like the way it is used and systematised in manuals. It is a very developed fencing system, with everything named, numbered and codified. It works very well as a system against any other and is scientific and logical – so much so that as a system you can apply the terms to other systems (for example numbering the cuts and thrusts for ease of teaching). Secondly, I love that antique sabres are still numerous and therefore cheap enough to be easily collected and handled. Nobody except the super-rich can afford to collect medieval longswords, which in good condition go for £20,000 and more. Even 17th century rapiers start at around £1,500, so 19th century sabres at £150 upwards are much more accessible. Lastly, I am really interested in the period that sabres mostly relate to – particularly the British and French colonial wars, which saw very diversely-equipped opponents and far more hand-to-hand fighting that was usual in the 19th century. I find the written experiences, written in basically modern English, by men who fought in India, China, the Crimea, Afghanistan, Persia, New Zealand and elsewhere fascinating. These men only lived 4 or 5 generations ago and were photographed, yet they faced hand-to-hand conflicts every bit as brutal and sometimes more bloody, than medieval warriors. From when you first started till today, what does your family think of your love for the sword (and fighting arts)? Growing up I suppose that my parents were fairly supportive of my hobbies, though it was not an interest they shared and it was something I pursued avidly under my own drive. I met my wife through HEMA and she is a co-instructor of another HEMA club, so of course she is very supportive and I hope I am of her also. My brother-in-law runs the club that my wife trains and teaches at. What advice would you have for a student who wants to learn historical fencing? Join a HEMA club as soon as you can and go regularly. If you can only get there once a month, or a couple of times a year, then do. If you can’t get to any club then try to travel to HEMA events – they always have classes catered for beginners. Contact with an experienced teacher and other students is invaluable – you learn so much quicker from other experienced people than you will from books or DVDs. If there are no HEMA clubs near you then starting a related activity such as sport fencing or jujitsu is good. It will help you progress if you are trying to learn HEMA from books or DVDs. Lastly, don’t be afraid to start a study group. Be clear with people that you are learning as well and that you can all learn together – this is how most HEMA clubs started, mine included. Once you have one or two other interested people then you can look at pooling resources and maybe having an instructor visit for a weekend, or all travel to an event together to learn. What does Matt like to do when he is not teaching, training, or making YouTube videos? Outside of working, HEMA, antique collecting, filming videos and other sword-related things, I like going to pretty historical places with my wife and daughter, I play computer games a little, I shoot black powder firearms and I spend far too much time browsing the internet. I also cycle on a daily basis and intend to get back into mountain biking at some point. It’s the Zombie Apocalypse and you have only one type of sword to choose from – what specific type would wield? In the Zombie Apocalypse I would choose a cutlass out of all swords, as it is better in confined spaces due to the length, it’s easy to carry, has a good hand guard, but also packs a lot of punch. And from all of us at the CombativeCorner, thank you Matt and to our readers, we sincerely hope you enjoyed the read!